TVs The Governess from the quiz show The Chase, Anne Hegarty, has spoken of her autism this week on the show I’m a Celebrity, Get Me Out Of Here. The response has been great. Immediately after Anne spoke the National Autistic Society website went down, due to heavy internet traffic. The response in Twitter, so often a forum for hate, has also been mostly positive also. Putting an autistic person on a show like I’m A Celebrity could have been car crash television, but instead has been heartwarming as the other contestants have moved round to support Anne following her and OCD contestant Rita Simons opened up to each other about their conditions. 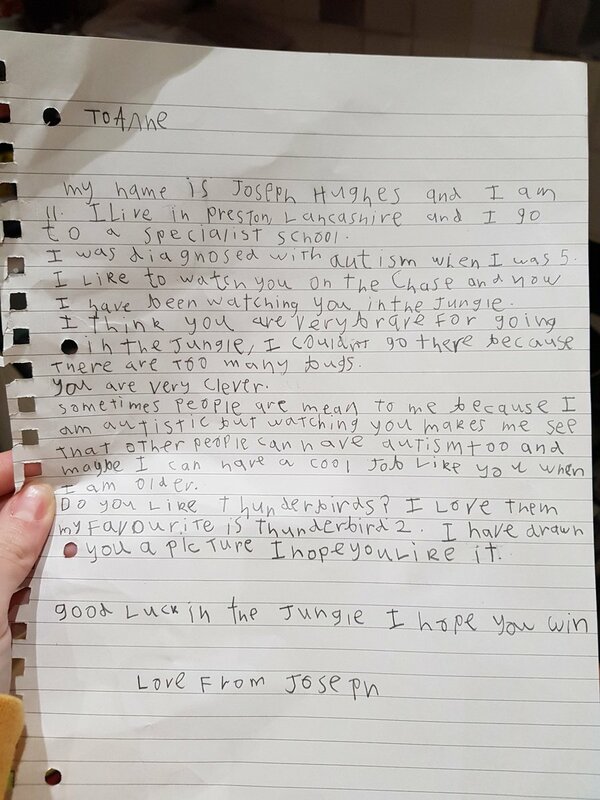 The jungle appearance has led to this letter to Anne being read on Wednesday morning TV. sometimes people are mean to me because I an autistic but watching you makes me see that other people can have autism too and maybe I can have a cool job like you when I am older. Thank you Anne Hegerty for your contribution to understanding our condition.